Bake chicken nuggets as directed on package. Cover to keep warm. Reduce oven temperature to 325°F. Heat taco shells and tortillas as directed on box. Meanwhile, in small bowl, mix sour cream, taco seasoning mix and enough milk for desired consistency. Set aside. 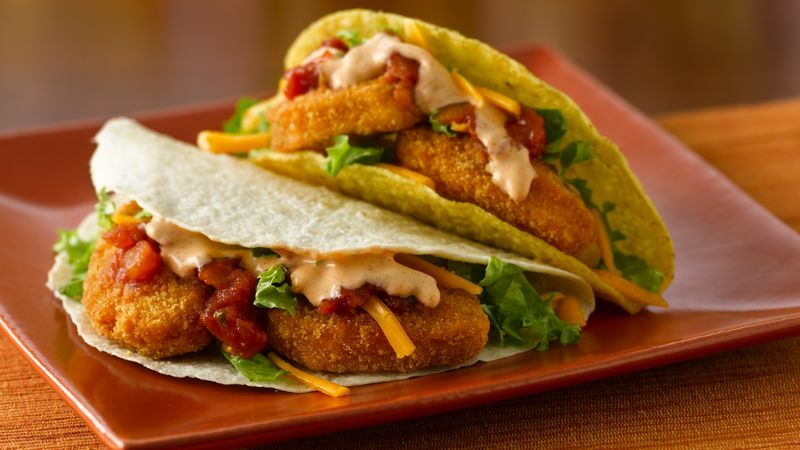 Fill each taco shell and tortilla with 2 chicken nuggets, cheese, lettuce and salsa. Drizzle each with sour cream mixture. Spice up these tacos by using shredded Mexican cheese blend and hot salsa.